The design, manufacture and application of safer products and manufacturing processes define the Green Chemistry revolution. We realized that chemist charged with making greener solutions decisions often did not have relevant biological data for their new chemicals so they often made decisions based on historical chemical classifications. Many believe that biological data is too slow and expensive to gather, so it rarely is collected. It is our view that chemist and material scientist should work more closely with biologists to leverage complimentary expertise to select high performing, but safer products. The key is to reduce the cycle time between new chemistry development and biological testing as this will lead to rapid iterative synthesis and testing. This iterative process will not only achieve safer products, but it should also lead the development of predictive synthesis rules to guide greener chemical solutions. 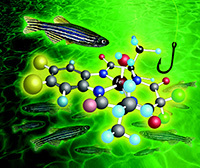 We have led the use of zebrafish for green chemistry and green nano resulting in numerous national and international presentations, workshops, manuscripts and review articles.